Hiking, exercise for people who hate exercise. Am I right?! Whether you enjoy urban hikes or backcountry treks, it’s important to know where you’re going, what to wear, and what supplies you’ll need to take with you. Believe it or not, there’s more to hiking than just owning a good pair of boots, and we’d love to share our knowledge with you! Join us in person, or check us out online via our Facebook LIVE event on the BCO Facebook page (www.facebook.com/BayouCityOutdoors/). Both events run simultaneously, and you can join the Q&A online or in person. If you do happen to drop in, you have the chance to win some very cool giveaways compliments of Whole Earth Provision. Plus, we’ll have refreshments provided by Karbach Brewing Co. and other snacks. The giveaway will be held at the end of the presentation. Each week we take a topic, drill down as quick & deep as we can, to get you up to speed and out playing. We’ll take Q&A after the presentation to help guide everyone into outdoor summer fun mastery. What topics will we cover? 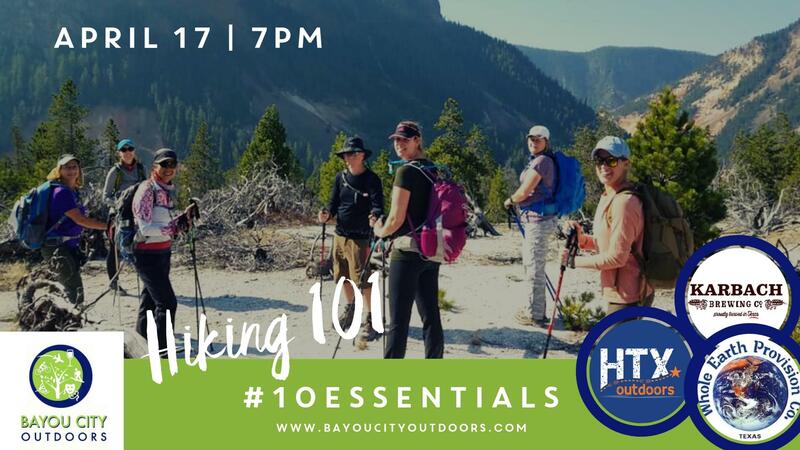 Join us and you'll also be able to download the free “#10Essentials for Hiking” that evening! It’s the comprehensive tip sheet for boots, gear, training, trails, safety and what to avoid. Itchin’ to hit the trails now? Join us on one of the featured Bayou City Outdoor hiking events: Keep an eye on the BCO calendar! RSVP at https://bit.ly/2Uy95AG . For additional information, please call 713-524-3567 or e-mail to info@bayoucityoutdoors.com. Get your copy of Houston A to Z while it lasts, today! You'll find 8 pages of the coolest, most curious and underground hidden gems of our city. It's everything you need to know to be a Houston aficionado and it's completely FREE - http://bit.ly/2gCCaIy.